Leather is one of the most versatile purse materials in the bag marketplace, and quality leather bags can last for years. You can purchase leather handbags at a variety of different price points whether you're looking for a great deal or considering an investment piece that you will carry for a very long time. Founded by Coco Chanel in 1909, the house of Chanel has become a powerhouse luxury brand. 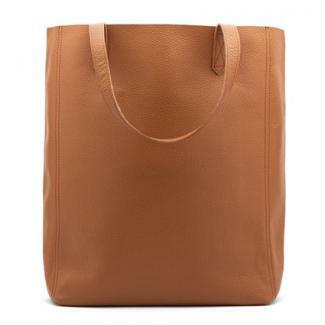 They offer several different bags crafted from high-quality leather. One of the most famous bag styles is the Chanel 2.55, a quilted leather bag with a double-chain shoulder strap, starting $4,900.00 for the medium size. Chanel also recently released an updated style, called the Chanel Boy, priced upwards of $4,500.00. This style is a little boxier and has more ornate detailing on the front of the purse. These investment bags are only available at Chanel boutiques, but you may also be able to purchase them secondhand from consignment stores. With a rich history stretching all the way back to 1837, there is no more coveted leather handbag than one from Hermès, specifically the Hermès Birkin and the Hermès Kelly purses. Each purse is handmade by a leather artisan and takes between 18 to 24 hours to produce. A Birkin costs upwards of $10,000.00 and is so exclusive that many have to join a waitlist in order to purchase one. If you're in the market for one of these coveted purses, only Hermès boutiques sell them. However, you can purchase them secondhand from consignment stores. This Italian luxury goods house has a long and storied history of high-quality leather bags. They are most famous for their mastery of the Intrecciato technique, a way of weaving leather that was invented by their namesake founder in the late 1960's. 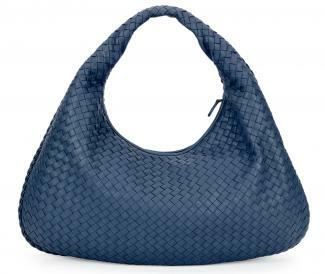 Their classic bag is the Veneta, a woven hobo-shaped shoulder purse that retails for $2,300.00. Bottega Veneta handbags are sold at their boutiques and at department stores like Barneys New York, Bergdorf Goodman, and Neiman Marcus. With a rich leather-goods heritage, Coach is a classic American brand. In recent years, their aesthetic has skewed more minimalist, and they have pared down on their logo play to highlight the quality of their leather. They release new designs every season, each in a large array of colors. However, many of their styles can stand the test of time, like some of the options within the Coach 1941 Rogue collection, which is a structured bag available in classic colors that work year-round and year after year as well as a few trendier versions to round out the selections. The Prairie Satchel is another beautiful, timeless option. Most styles cost upwards of $350.00 for a shoulder bag. You can purchase the full range of Coach bags from their website and from boutiques, but their outlet stores carry much more affordable options. Well known for their quirky designs and colorful purses, kate spade new york offers a huge variety of everyday, high-quality leather bags to choose from. You'll find everything from cross-body purses to larger tote bags perfect for work. They introduce new styles every season, but their perennial classics are always popular. 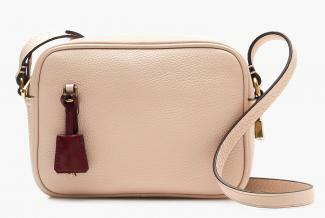 These include the Cedar Street Maise with its removable crossbody strap, the small, round Cameron Street Byrdie, and the Cobble Hill hobo style in soft pebbled cowhide. 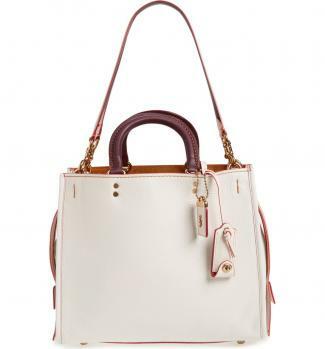 These bags often run upwards of $250.00 for a tote, but kate spade new york has frequent flash sales on their website. You'll also find these bags at their retail stores, and there are a few outlet stores with good deals. Michael Kors is a contemporary American brand that has expanded rapidly in recent years. The handbags from the Michael Kors line runs upwards of $795. However, the company is also well-known for the leather handbags from their diffusion line, Michael Michael Kors. The Travel Jet Set Saffiano Tote, Savannah Satchel, and Selma Satchel are all bags that many associate with this brand, and they retail for between $280.00 and $350.00. Saffiano leather is a treated leather with a cross-hatch finish and is very resistant to scratches and water. 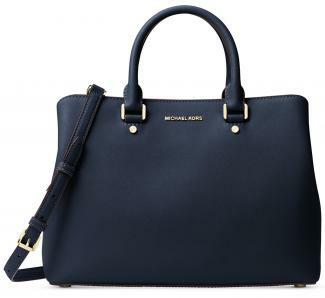 You can purchase Michael Kors bags in their boutiques, online, and from department stores like Nordstrom and Macy's. 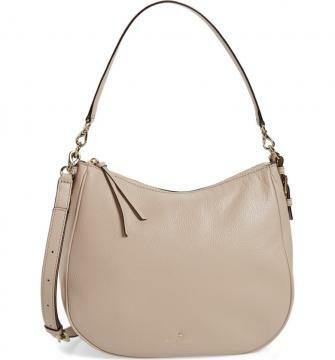 Although J.Crew is well known for their fun, preppy apparel, they also do some great leather bags in sleek shapes. These pieces are well made and crafted from soft, supple leather. Their Signet Bag in Italian Leather (below) is just over $100.00 and the perfect size for carrying the essentials, crossbody-style. Most colors can be monogrammed. It comes in a wide range of color combinations. J.Crew bags range from just under $100.00 for crossbody styles to around $300.00 for totes, making them very reasonable investments for 100 percent leather purses. You can buy these bags are at J.Crew stores and online from the company website. New-kid-on-the-block Cuyana is an e-commerce brand with a philosophy to design essential pieces for the modern woman. Their bags have simple designs with limited hardware and are made from very high quality leather. Their standout bag is the Leather Tote (around $200.00), which you can get monogrammed for an additional $10.00. These bags are available online and their San Francisco showroom. Cowhide: This is a more durable option than lambskin leather. It, of course, comes from cows. Cowhide is usually higher quality than other options on the market, and more expensive. Lambskin: Lambskin is softer to the touch than cowhide leather, but it generally won't last as long. It's usually smooth and has a soft sheen, but if you're going for quality and longevity, this may not be the best choice. Pebbled: When you run your hand across the surface of a handbag, you may notice a textured, bumpy finish (you'll also be able to see it). This is pebbled leather. In general, it maintains a nice appearance longer than smooth leather because it is more resistant to scratches. Smooth: As the name suggests, the smooth leather is just that. It looks creamy and luxurious, and it may have a soft sheen. It feels supple and smooth to the touch. It scratches more easily than pebbled leather. Suede: This material has a matte finish and looks a lot like velvet. It's higher maintenance than other leather types (shouldn't get wet, scuffs easily, etc), which means it doesn't make the best option for an everyday bag. Business Insider warns to steer clear of "genuine leather" if you want a durable item that lasts for years and retains a lovely finish. They're lower quality than other items, made from layers of low-quality leather that have been glued together and painted. These handbags will not stand the test of time as well as others, in looks or durability. They will, however, be less expensive in most cases. Top-grain and full-grain leather will be better choices, with top-grain leather being used more often in handbags. Full-grain leather ages marvelously and develops a gorgeous patina, the article explains, whereas top-grain leather lasts longer than "genuine leather" but does not age well over time. With full-grain leather, you're getting the entire grain of hide with all of its imperfections (if there are any) and strength, but you'll be paying a lot more, especially when you're purchasing from a designer that will not take hides that have imperfections on them. Top-grain leather comes from full-grain leather that has been worked on to remove imperfections, which means it has been sanded, dyed, and stamped with fake grain to achieve a beautiful, uniform finish that won't be especially durable, according to the Business Insider piece. When you're shopping for a quality leather bag, there are a few other things to look at outside of the leather exterior. Look at the stitching. Is it straight and secure, or sloppily done? Is the lining straight and sewn in properly, or is it loose? Does it have any holes? You probably won't see holes in a new purse's lining, but it's worth careful inspection if you're purchasing one from a consignment shop. Also take a look at pockets to make sure they aren't torn or coming loose. Do the handles or straps seem to be securely attached to the bag? This goes along with checking the stitching and seams, but you'll want to pay special attention to this area. Consider the weight of the bag before you even put your belongings inside. Some leather bags have substantial hardware that could result in physical pain (in the head, neck, shoulders, or lower back) because of the weight. If you carry your purse for long periods of time on a regular basis, a heavier weight may make you regret your purchase. This is more of a preference issue than a quality one, but chances are you're spending a few hundred dollars on a high-quality bag and don't want to feel buyer's remorse set in because of the hardware. The leather should have a soft, supple feel. The leather should not be stiff. Stiffness is a sign that the leather has been coated to hide many imperfections. The color should be consistent and not blotchy. Smell the purse. High-quality leather does not smell of chemicals but has a distinct leather smell. You will be able to easily tell the difference. Watch out for faux leather or "pleather." While faux leather has its place in fashion, if you are paying for a leather purse, then you want the authentic material. The easiest way to recognize faux leather is from the texture. Pleather has a very smooth, almost plastic-feeling surface. There is tremendous variety and availability when it comes to purses made from leather. Providing the perfect blend of form and function, this material is also very easy to maintain. It's easy to see why well-made leather bags have an important place in almost every woman's purse collection.